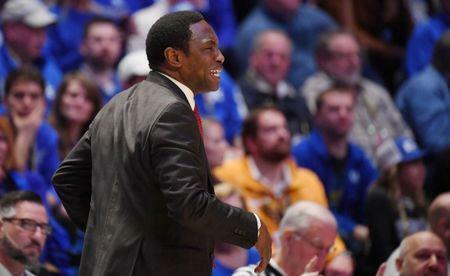 Alabama and basketball coach Avery Johnson parted ways Sunday, just three days after the Crimson Tide suffered an opening-round defeat on their home court in the NIT. The two sides had spent the past few days negotiating a buyout of Johnson's contract, though no terms were announced on Sunday. "After meeting with Coach Johnson, we made the decision to mutually part ways," Alabama athletic director Greg Byrne said in news release issued by both Johnson and the school. "This was not an easy decision, and we thank him for his contributions over the past four seasons. We wish Coach Johnson and his family the very best." Alabama will begin the search for its next coach immediately, according to the news release. Assistant coach John Pelphrey will serve as head coach in the interim. "I would like to thank The University of Alabama, Bill Battle and the Board of Trustees for providing me the opportunity to serve as the head basketball coach," Johnson said in the release. "I'd also like to thank President Bell and Greg Byrne, our assistant coaches, support staff, the fans and student body for making this such a special experience for me and my family. Finally, and most importantly, I'd like to thank all of the players and parents. It was an honor and privilege to work with these young men and their families. This was an opportunity of a lifetime." The SEC now has three openings for a head basketball coach: Alabama, Texas A&M and Vanderbilt. The top-seeded Crimson Tide were stunned 80-79 in overtime at home by Norfolk State on Wednesday night. Johnson, who turns 54 on Monday, became Alabama's coach in 2015, but the Crimson Tide have made just one NCAA Tournament in his four seasons at the helm. Johnson's contract ran through 2023 and was set to pay him approximately $3 million annually. It called for the school to pay him $8 million if was fired without cause before April 15, but fell to $6 million after that. In his four seasons at Alabama, Johnson went 75-62, with a 34-38 conference record. As an NBA coach, Johnson has a 254-186 record over stints with the Dallas Mavericks and New Jersey/Brooklyn Nets. He was the NBA Coach of the Year following the 2005-06 season, when the Mavericks finished 60-22 and won the Western Conference title.